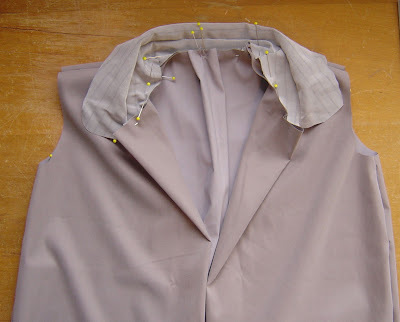 Everything Just Sew: Baby trench part 2, the RIGHT collar this time. 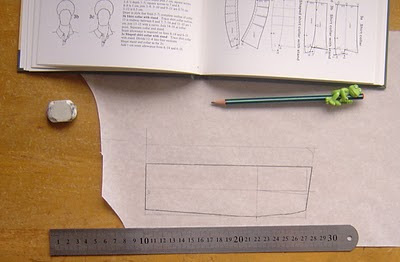 This is another illustration of why I call this blog Everything Just Sew. If it isn't "just so" it will drive me insane and MUST be redone, regardless of the time and effort involved, even if no one else IN THE ENTIRE WORLD will notice what I did. In this case, the collar of my baby trench coat. The basic one piece collar I'd drafted was nagging at me. I could see it in my head, and it looked wrong to me (bear in mind that I've only seen this in my head - I have yet to sew any of this coat together!) So despite the fact that hardly anyone would notice or care, I redrafted a proper two piece stand and fall collar. I feel so much better now! 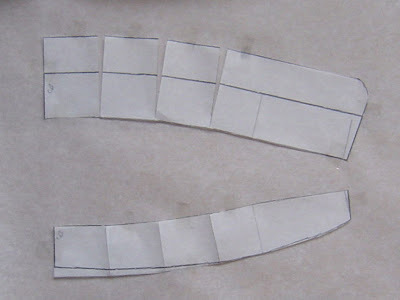 Here's the process, following instructions found in Winifred Aldrich's Metric Pattern Cutting for Menswear. My copy (bought on a bargain table - SCORE!) is the 2nd edition. Firstly I traced my original collar since the two piece one I wanted is based on the same style of collar. The darker line in the picture below is the original collar, and the lighter line (pretty hard to see, sorry) shows the new collar size, and the stand. Since most drafting is based on measurements you plug into a formula it was easy to use these instructions for my new collar. I did have to scale back where they gave a measurement of 4.5cm for width of the stand - obviously too big for a size 2! Next step is to cut the pieces apart and slash them vertically to open up the outer edge of the collar and close up the top edge of the stand. Again I scaled back the overlaps and spreads to match the scale of much smaller pattern pieces. This was not something I was prepared to construct without trying first, so I cut a quick mock up of the collar pieces from some scrap fabric I had to hand, sewed them together, and pinned it to the pinned together fronts and back of the coat. Since nothing is sewn, clipped, pressed etc it was impossible to get it to sit nicely to photograph, but when I held it and manipulated the pieces with my fingers I could see that it will sit nicely and look how I want. So now I feel like the coat can progress. Right after I get to Spotlight for thread. Oh well thank goodness, because seriously you seem like the kind of wicked person who not only has five children, makes gajillions of garments, bakes biscuits for all the school fund-raisers (from scratch) and takes the eldery on trips to the zoo or whatever, but ALSO manages to have a spotlessly clean house. Frankly, until I see evidence to the contrary, I'm going to persist in my belief of your tidy home. Or convince myself that it's ok that I haven't washed the kitchen floor for almost two weeks. One or the other, I haven't decided yet. And no, it's not snowing anymore, today was... let's see (thinking thinking thinking looking it up on google because I can't do the calculations....) was over 18C. Perfect weather, to my mind. Hopefully spring is finally here and we'll have this good weather for a month or two. By the end of May, it will most likely be about 35C and it will just go up from there. 46C is the highest I've ever seen it get, but that's high even for here. 43C is more likely. There you go, a little lesson in the weather patterns of northern Texas. Sorry. Too boring! What I wouldn't give for your ability to 'see' the finished effect before sewing. Ilike your essence of trenchcoat.Can't wait to see it finished. Lovely dresses too!